A 50/50 blend of Organic Grass-fed Ghee and Organic Virgin Coconut Oil. 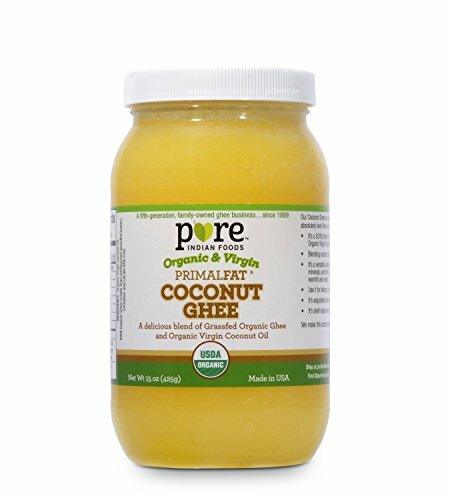 Pure Indian Foods was the first ghee brand to receive the Whole30 Approved seal in 2011. Truly delicious, powerfully nutritious natural cooking and baking blend. Packed in non-leaching PET plastic container and lid that are BPA free. Ideal for baking, sauteing, stir-frying, and more. It adds delicate, exquisite flavor to all of your favorite foods and recipes without an overpowering coconut flavor. Both coconut oil and ghee are natural, health-building fats that complement one another beautifully. If you have any questions about this product by Pure Indian Foods, contact us by completing and submitting the form below. If you are looking for a specif part number, please include it with your message.